The paper presents the results of scientific research into the former southernmost Bosnian border by analyzing historical maps. In cartographic representations of the area (created between the mid-17th and mid-20th centuries), state and administrative boundary lines are clearly demarcated. 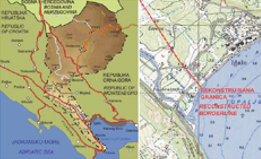 They provide indisputable proof that the Sutorina area belonged to Bosnia and Herzegovina through many centuries, providing access to the Adriatic Sea. The maps presented follow the course of the historical changes in the area which shaped its borders. The extent of the narrow Sutorina corridor was observed by combining data on boundary lines taken from historical maps with the current situation in the area. The technique of georeferencing old maps based on a genetic algorithm was developed for this purpose.